Bartering on Khoasan Road in Bangkok; hopping one Thai island to the next; trekking through the jungle on the back of an elephant–There is so much to see and do in Thailand from the north all the way to the south, but my top recommendation for things to do in Thailand is a trip to Chiang Mai in northern Thailand and a 2 or 3 day trek through the surrounding mountains. Friends and I opted for the 3 day experience. For only 1300 baht ($42), we had our accommodation, meals, and entertainment covered for the next 3 days. The excursion included a guided hike through the mountains, a swim or two in the waterfalls, a 15 minute elephant ride (believe me, 15 minutes was plenty), bamboo and river rating, and an overnight stay in a tribal village one night and the jungle the next. 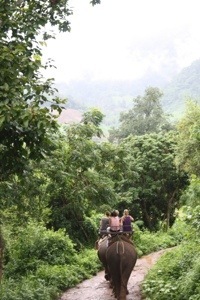 We started off our 3 day Chiang Mai jungle adventures with an elephant trek through the surrounding mountains 3 hours from the city. 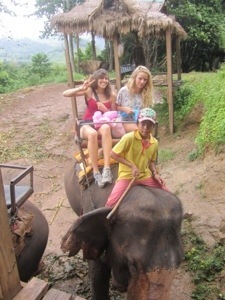 Snack time for the elephants before the trek through the jungles of Chiang Mai. 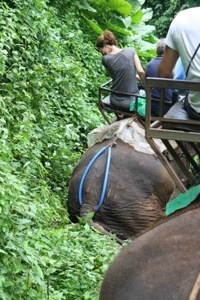 The elephants trekked through mud and up and down narrow mountain paths like it was nothing. The universal scratching rock used by all elephants on this trek. My advice–don’t sit on the rocks. We hiked for miles– The fist day from elephant camp to a waterfall and ended our hike at the local village tribe where we camped out for the night. 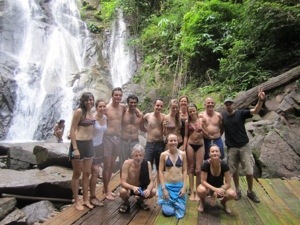 The second day from the tribe to another gorgeous waterfall to the jungle huts where we spent our second night. The third (and final) day from our hut to the river and bamboo rafting adventure and back to the base. 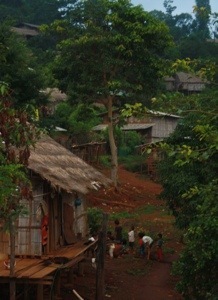 The local village tribe where we spent night one of our three day trek. We lived liked the locals with no electricity or communication with the outside world. 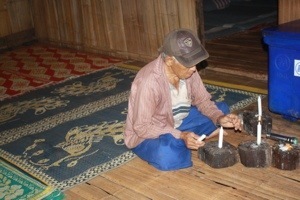 This Thai man took good care of us preparing for nighttime and bringing some light into our dark hut. We shared this bathroom with the local occupants—SPIDERS! 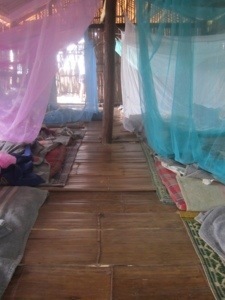 For sleeping on the floor, our beds were quite comfy and rather stylish with the colorful mosquito nets protecting us from unwanted bites! 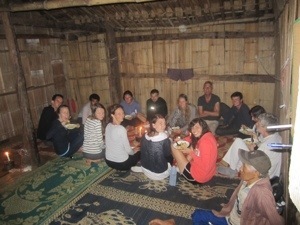 Homemade Thai food for the candlelight dinner with our group! 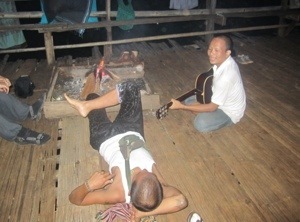 Live entertainment provided by the locals in English and Thai! This talented musician moved to the village tribe after marrying his wife 10 years ago and now lives a happy and simple life in the mountains outside of Chiang Mai. Our guides taught us the fascinating secrets of nature. For example, when opened correctly, this plant can be used to blow bubbles! I like to call it the Bubble Plant! Gorgeous waterfalls lay in the depths of the jungle. 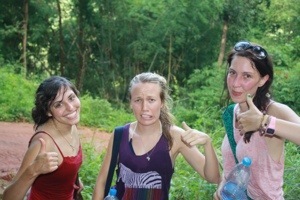 The cool waters made for refreshing pitstop during our long and sweaty hikes! We really enjoyed our unique experience in Chiang Mai, Thailand with a very diverse and one-of-a-kind group.